Specter's approval ratings have taken a hit in recent months, according to a new poll. 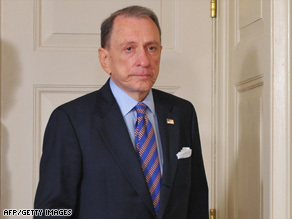 (CNN) - A new poll of Pennsylvania voters suggests that Sen. Arlen Specter's job approval rating has nose-dived over the past few months. Thirty-four percent of those questioned in a Franklin and Marshall College survey released Thursday approve of the job Specter's doing as senator. That's down 18 points from a 52 percent approval rating in a Franklin and Marshall poll conducted in March. The survey also indicates that only 28 percent believe Specter deserves to be re-elected next year, down from 40 percent in March. "The poll indicates that the party switch hurt him among Republicans - which is not surprising - but that it also hurt him among Independents," says CNN Polling Director Keating Holland. He adds that the number of independents who think that it's time for a change jumped from 37 percent in March to 69 in June. "Most of that change comes from independents who had no opinion about Specter's re-election before the party switch but appear to have a definite opinion about Specter now." Specter is almost certain to face a Democratic primary challenge in 2010 from Rep. Joe Sestak. The poll suggests that if a hypothetical Democratic primary were held today, one in three Democrats would back Specter, and 13 percent would support Sestak. Nearly half are undecided. "This poll did not match Specter against any likely GOP candidates in a general election match-up," Holland notes, pointing out that it is still very early in what is likely to be a tough Senate fight. "It's possible that many independents who dislike his decision to switch parties now may vote for him when they are faced with the choice between Specter and a conservative Republican." The Franklin and Marshall College survey was conducted June 16-21, with 580 Pennsylvania adults questioned by telephone. The survey's sampling error is plus or minus 4.1 percentage points.